There are some things that I know you will want to be able to do; change a tire, make biscuits, and play a song on the guitar. A guitar: This can be dusted off from your own closet, borrowed, or from the pawn shop or thrift shop- unverified statistics on the Internet suggests that 2.9 million guitars were sold in the US in 2006. Exactly; you ought to be able to toss a stone into one from where you are sitting right now. Time: Give it say, 30 minutes. We aren't going to Carnegie Hall; maybe a campfire circle, or perhaps an audience of one small 3 year old music appreciator. A Simple Song: Yes, I have one right here! 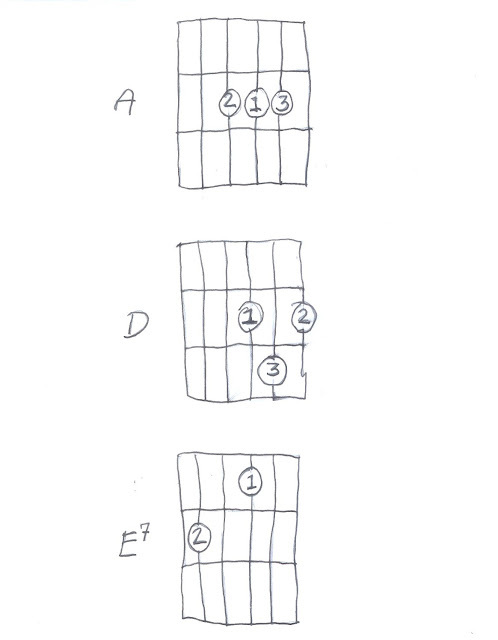 Three chords, easy as pie: King of the Road, by Roger Miller. You will need to put the big end of the guitar into your lap, and the small end, the neck, into your left hand. You will also need to see if your guitar is sounding ok- you can tune it, if you want to get fancy. Asking the person you borrowed it from to tune it is also good. Use this doodad, if you like. The top string is the left-hand side of the diagrams, and the lowest sounding string. Some of the folks call it 'G.' Don't get bogged down in a lot of nomenclature; remember, our song is about smoking, freedom from responsibilities, and being happily broke. Next, you'll need to get your left hand's fingers to press on a few strings, while the right hands fingers or thumb, brush along the strings over the hole in the large end of the guitar. 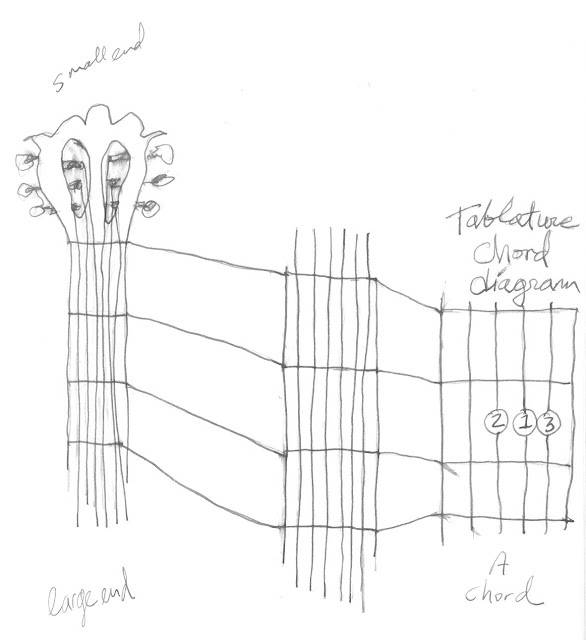 The diagram below shows the relationship between the guitar's neck, fret board, and strings, and the chord diagram. Vertical lines equal strings, horizontal lines correspond to the frets on the neck of the guitar. Frets are the raised thin bars on the neck of the guitar. We only need the first three of these sections. 1 = index finger, 2 = middle finger, 3 = ring finger, etc. 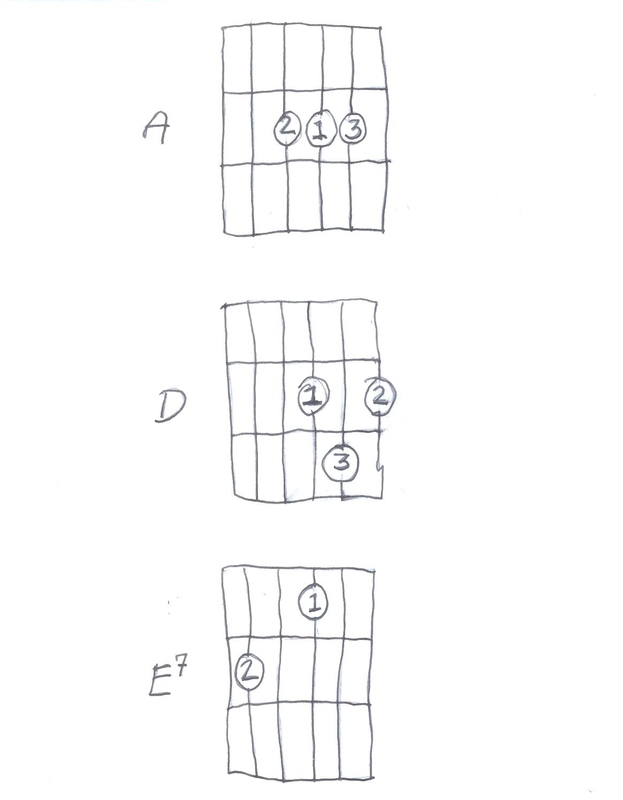 The top of the diagram is the small end of the guitar, and the line farthest to the left is the top string (G). Just keep it all pointed north and port and you'll be fine. Ok, the right hand- like I said, anything here is fine- brush the strings from top to bottom. One strum to a count of 4 beats is good, or 4 strums is also good. Anything you like. Really. I like thumping the top string with my thumb, and then brushing the rest of the strings downward with the back of my fingernails. I do this twice for each measure, which is the space between the slashes (/). So, what exactly are the slashes and the big letters? The big letters are the chord names, and you switch to the next chord when you get to the next slash. Sometimes, you just repeat the same chord. Ready? Try it, you'll love it! Play it loud, and sing it louder. I'll be listening for you! Buys an eight by twelve, four bit room. Third box car, midnight train. Old worn out suit and shoes. I'm a man of means by no means.